Dubai sale marks third top auction of Fairtrade designer’s jewels. Fairtrade Fairmined gold jewellery created by Annaloucah has raised $32,000 (£19,687) at auction in Dubai, for Oxfam. The ring and pair of earrings, crafted in 18ct Fairtrade Fairmined ecological white gold and set with diamonds from Jeweltree and pink tourmalines from Brazil, were made for and worn by green campaigner Livia Firth for her Green Carpet Challenge at the Cannes film festival earlier this year. The set – called Radiance – was sold at auction in Dubai over the weekend, with Firth in attendance and writing a blog piece for Vogue about the auction. Loucah – who was named a Trailblazer in the Professional Jeweller Hot 100 2011 – has worked closely with Firth previously, creating pieces for her to wear on the red carpet using ethical or Fairtrade metals and stones. Over the past 18 months Loucah’s jewellery has been part of three separate auctions, raising a total of £80,000 for Oxfam, something Loucah says she is “very happy about”. 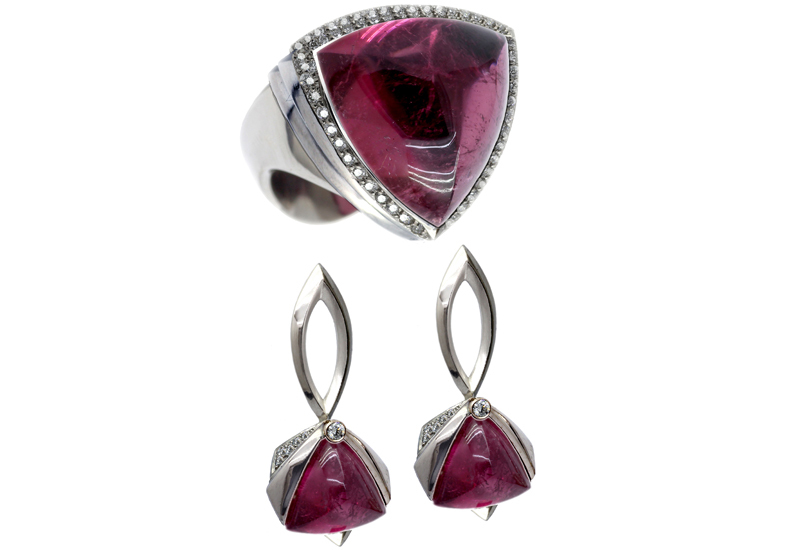 In December last year Loucah’s ruby and pearl Fiore della Notta earrings sold at a similar auction in Dubai, while a set of white gold jewellery set with 35cts of ethically-sourced aquamarine from the Lundazi community owned mine in Zambia sold earlier in 2011 at auction, raising £25,000 for Oxfam.